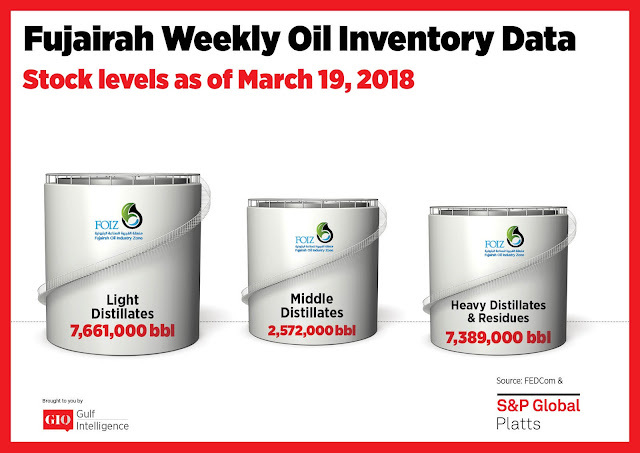 Total oil product stocks in Fujairah stood at 17.622 million barrels as of Monday, up 10.4% as all three product groups saw increases, according to latest data from the Fujairah Energy Data Committee, or FEDCom. Stocks of light distillates rose by 14.5% week on week to 7.661 million barrels. So far this year, they have averaged 34% higher than in the first quarter of 2017, S&P Global Platts Analytics said in a report. The East of Suez gasoline market continues to look sluggish, weighed down by heavy supplies from Asian refiners such as China and South Korea. 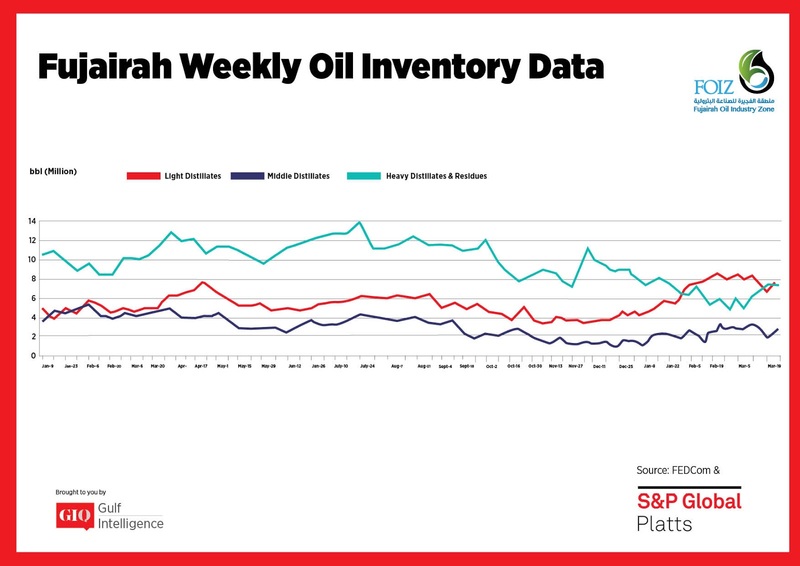 Demand in the Middle East was also soft, with spot premiums for Arab Gulf Gasoline RON 95 falling to a 12-month low of $2.00/b this week, Platts Analytics said. "We still see a steady stream of supplies from northeast Asian refiners, but very little additional demand in terms of fresh spot tenders" a Middle Eastern trading source said. Stocks of middle distillates rebounded by 34% to 2.572 million barrels. This is after a drop of 25.4% a week earlier when stocks fell to a seven-week low. Despite the large week-on-week jump, stock levels remained within the range seen over the past two months. The volume of ultra-low sulfur diesel moving from East of Suez to Europe in March was set to be around 1.7 million mt, according to data from market sources and Platts trade flow software cFlow. This is despite a strong gasoil exchange of futures for swaps, which generally signals unfavorable arbitrage economics, the report said. However, premiums for Arab Gulf 10ppm Gasoil have been under $1/b since the beginning of February, indicative of the weak demand for gasoil volumes to remain East of Suez. Meanwhile, cargoes of jet fuel from the Middle East continue to be drawn to Europe, the report said. 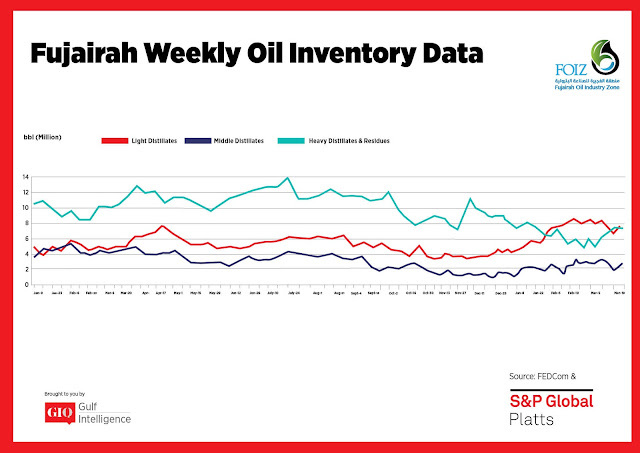 Heavy distillates and residues also saw a marginal rise of 0.5% week on week to 7.389 million barrels, staying close to a two-month high. The entire complex has shown little volatility so far this year, so Q2 is expected to be much the same, with no major changes expected, market sources said. The market is already looking forward to June towards the summer season when utility demand in the Middle East returns. Summer demand could also see a resumption of Pakistani fuel oil tenders loading from Fujairah, which have been absent since January due to increased LNG imports. Premiums for the benchmark Arab Gulf 180 CST FOB cargoes remain at a four-month high of $10/mt.